Walter Leblanc was a Belgian artist. He was educated at the Royal Academy of Fine Arts and the National Higher Institute in Antwerp. In that period, these studies were devoted to figurative art. However, he evolved towards the monochromy, Opart, ZERO and kinetic art. The activities of the G 58 group in the Antwerp Hessenhuis, of which he was the co-founder, were a very important direction for Leblanc. He came in contact with the international avant-garde, as the German ZERO, group Nul from the Netherlands and he joined the international movement Nouvelle Tendance (1961-1973). 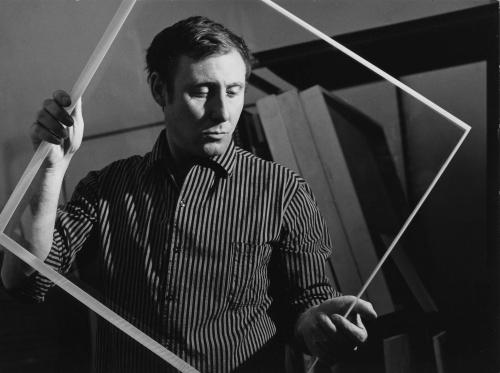 In 1959 he introduced the torque as a basic element in his work. Depending on the displacement of the spectator and the varying incidence of light on the relief, a vibrating, optical effect is created in the eye of the participant. Throughout the entire oeuvre of the artist, there is a tendency to emerge from the plane.